How to watch Parade's End: Parade's End (2012) on Netflix Costa Rica! Sorry, Parade's End: Parade's End is not available on Costa Rican Netflix, but you can unlock it right now in Costa Rica and start watching! With a few simple steps you can change your Netflix region to a country like United Kingdom and start watching British Netflix, which includes Parade's End: Parade's End. 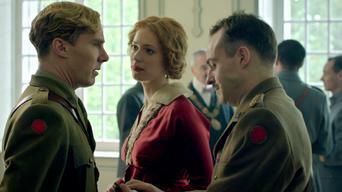 We'll keep checking Netflix Costa Rica for Parade's End: Parade's End, and this page will be updated with any changes. Parade's End: Parade's End is not available in Costa Rica BUT it can be unlocked and viewed! This World War I-era miniseries chronicles the tangled relationship between an aristocrat, his beautiful but unfaithful wife and a young suffragette. They're spoiled, stuffy, sexually repressed and on the edge of war. They're bound to make mistakes. Juicy ones. Parade's End of Parade's End has 3 episodes. Because different Netflix countries have different availability for episodes, you'll need to check the episode listing below to see which are available in Costa Rica. In Edwardian England, aristocrat Christopher Tietjens enters into a destructive marriage with the beautiful but cruel socialite Sylvia. Vicious rumours about Christopher cause a tragedy. Sylvia finds a new admirer who proves to be a distraction as the war continues. Christopher is sent to the Front. Sylvia makes one final play for him, which provokes a reaction from Valentine.